The number of elephants being poached is set at almost 50.000 by Gerbrandy. The Cambridge Dictionary definition of ‘to poach’ is: “to catch and kill animals without permission on someone else’s land.” The statistics on the number of elephants being poached differs. It’s hard to make an exact calculation since it’s illegal and happens all over the world. World Wildlife Fund (WWF) says they keep to the number of around 20.000 elephants a year. That’s an average of 55 a day. But WWF also emphasizes that this number is hard to determine. “Others stay with 30.000 a year, but it for sure is not 50.000,” a WWF spokesperson informs EUfactcheck. WWF base their data on a database from the Convention on International Trade in Endangered Species of Wild Fauna and Flora (CITES). This organization calculate their numbers on the confiscation of ivory by the authorities and on the amount of found carcasses. This method is called MIKE (Monitoring the Illegal Killing of Elephants). TRAFFIC, an organisation specialised in wildlife trade, which works closely together with CITES, confirm that the number of elephants being poached is not up to 50.000. According to Dr. Richard Thomas, global communications coordinator at TRAFFIC, the highest estimate that was issued by CITES (based on their MIKE method) is 25.000 elephants per year in 2011. “Since 2011, poaching levels have dropped, although not by a lot and they still remain unacceptably high,” Thomas says. He also mentions that at its worst, the levels of elephant poaching were into the tens of thousands a year, but in recent years these numbers have seriously dropped. These numbers are a world estimate, but most elephants are being poached on the African continent. According to WWF, levels of elephant poaching in Asia are much lower than in Africa and elephant declines there are much more a result of habitat destruction and human wildlife conflict. 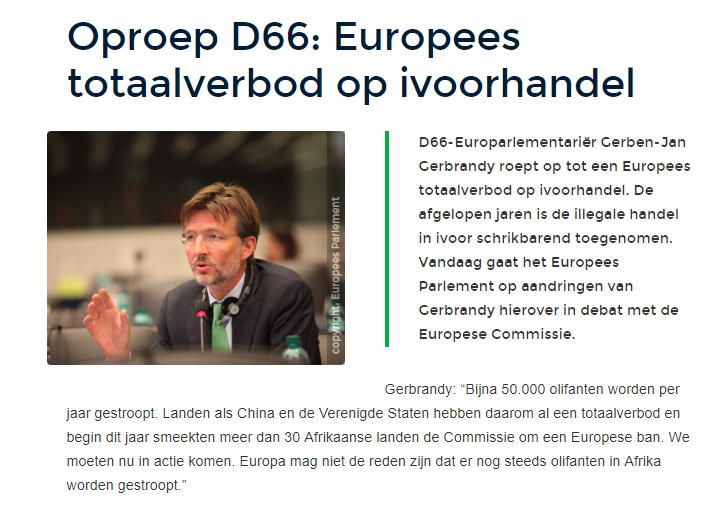 D66 has let EUfactcheck know that they got their numbers from a BBC article from 2015. They agree that the CITES statistics are more reliable and will change the number in their original article. The number of elephants getting poached is by far not up to 50.000, but around 20.000 to 30.000. Which is of course still a striking number. We conclude that the claim is false.